When I arrived at Banff I’d been battling with words for several months. Now, three weeks after the end of BRiC, I am rhyming countless couplets as I sing my song with text; two 7000 word papers beneath my belt, an artist book complete, two more book outlines started, and what seems like a million tumbling post-its, pages, word files, more… So I will begin where I conclude, and conclude where I began. < and when does laugh become sing? Laughter can mean many things, of that we can be sure. We roar because we’re angry? We cannot find a way? To let this joy inside roll out, to play anew each day? The Commons is our goal here, our posts, our ball, our ground. and whose ground do we score? We better |- find ] some more. To open up the door. <and what needs to happen for play to become find? A sense of commitment, not running away before the end of the game, trying out play by another’s rules, dipping the toe in the pool. Walking a mile in another’s moccasins,  pause to reflect on the taste of it all. And Where [Are You Going] / [Do You Go To] When You Go There? Is an installation by research artist Jackie Calderwood, created during the three week Banff Research in Culture thematic program On The Commons; Or, believing-feeling-acting together at the Banff Centre, Alberta, May 2011. 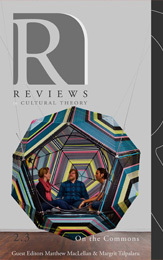 The work is a personal response to the residency themes and arises from an auto-ethnographic/reflective investigation concerning moments of noticing and spaces of thought. The thread and pin line drawings trace mountain horizons photographed during a journey from the Banff Centre to Lake Louise. Audio recordings are from the Louise Lakeside. 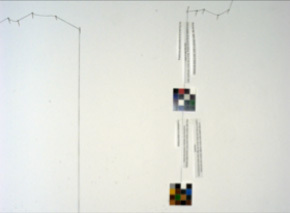 Colour Grids and text have been recorded using the Hunter Gatherer iphone app (Calderwood, May 2011) as a diarying tool intended to facilitate ‘noticing what you notice’ and ‘paying attention’ in the moment. Phrasing of the question ‘And where are you going when you go there?’ comes from New Zealand psychotherapist David Grove’s pioneering body of work, which includes Clean Language, Emergent Knowledge and Clean Space (See Lawley and Tompkins, Sullivan and Rees). ‘Clean’ refers to a state in which any prior expectation or need for interpretation is placed aside, focusing instead on the unfolding ‘metaphor landscape’ of the client in a graceful exchange of discovery in which new information and alternative solutions can effortlessly emerge. The question can be used as an entry into the as-yet-unexplored realms of the metaphor landscape; similarly in the context of retrieving or reconnecting access to ‘lost’ or ‘absent’ moments of time in space – when our mind ‘wanders’ or we ‘slip away’. Hunter Gatherer app has been developed as part of Jackie’s recent commission for the GeoArtCache project with Chrysalis Arts, North Yorkshire, England. Thanks to my fellow studio residents who have generously encouraged me to adorn the studio, turning our walls into my own spaces of thought. I want to speak to you now. And of times past. And times yet to come. Some of these will be times you have no desire to unfold. Some may be familiar. Some may be strange. Some of the words I use will be a little un-tame. then just ask me gently, I’ll show you the door. I play with them freely to keep in the flow. then leave with this feeling: I’ve written for you. This is the title of the piece of work I have yet to make. It is a piece in which there are many frames. Found frames, recycled, bought new, made for the work, constructed from salvage, designer, scrap, free with a $1 magazine, treasure collected from thrift stores, ornate and exquisite: anything goes. 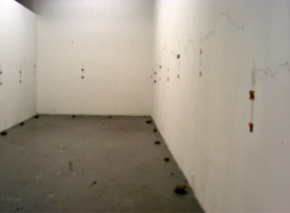 The frames are installed in a gallery space, the walls painted black. It’s the kind of gallery you find in a museum. I saw something similar in Tate Modern where they were presenting a retrospective of intimate works. The main arte-facts were substantial sculptures, lit in clear white space. Plenty of room to walk around them, to explore from different views, to place the context of one of five works within the others. To be amazed, impressed, touched, inspired, critically aroused, offended, puzzled, intrigued… The dark room, in contrast, showed the series of the work. The artist’s questioning with herself. A dialogue of uncertainty, room for contradiction, to see the work evolve. Not the grand gesture of the white space, more an infinite mirror of enquiry through the authenticity and integrity of self. A capture of a moment in time. But not of time realised, as the white cube; rather of time yet to unfold. The potentialities of the moment. The artists’ dream unrealised in many forms… which route would unfold over the coming decades of her practice? How would this work, this documentation, be read in years to come? So the world in a grain of sand takes that setting, of dark surround – the dark not of fearfulness, but the dark of exploration, potential, the as yet un-formed or un-known (to us as humans in this moment of time, to be clear). In this rich dark space the frames are fitted neatly onto the walls. Some high, some low, some close together, some far apart. They are each complete, yet they have relations within the whole. And each is perfectly lined with a rich dark textile. Perhaps it is vellum, or velvet, silk or chiffon. Perhaps some are mohair, some alpaca. They are textures of material, rich from the natural world. Or are some chemical constructs of the human-made variety? Plastics, nylons, hi-tech survive-all-terrains-with-minimal-weight? Perhaps they are all types of cloth, woven together within the varied processes and fabrics of time. Many frames, perfectly squared, at discoursant heights, distances, dimensions. Each with a rich dark fabric held perfectly within. And each contains a seed. One single seed. A seed as a grain of sand. Or is it in fact a grain of sand? And where is it positioned in the frame? These are the questions I have been asking myself during this residency – what is the frame, and within it, does the seed have life, can it grow unconstrained? Can the seed become interchangeable for a small piece of silica – and if so, what colours refract as I view the world from this frame, in infinity, from this moment in time, within this single grain of sand? In the daylight I notice the shadows are far more delicate. 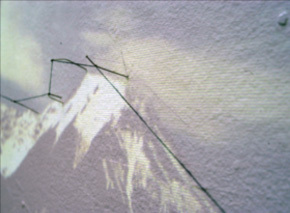 Fine lines gently etching their precision onto the surface of the wall. The pinheads take on more significance; each a mirror pool of light, a miniature sun or moon reflecting the light of the sun from this new planet of the wall. The surface of the moon has texture, telling another story. There are areas of pitting that could be lunar oceans, or perhaps areas where many have thought before. They map a topography that stretches into the beyond; beyond the focus possible when viewing the wall from this distance at which each moon is clear and bright. Step away and the moons loose their significance, the sweeping arc of the story becomes one of what is un-done, not done, one of incompletion and untold fragments. The lacking of the whole. Step closer and sitting beneath my mountain range I look up and see stories of voyages of remarkable people, each pin marks an achievement in the voyage of humanity. ‘We’ve reached this point!’ The pins gladly exclaim, as the thread of time holds each supported and connected by the past, each forms the stake of a hand-rail in the vision to explore. Routes may change, pace extend and contract; the continuity is theirs, there, just the same. The picture holds less prominence in the daylight, colours bleached by the light of the sun. //Aside: Which is louder, sunlight or moonlight, I hear you say. You love to play this looking glass game, this constant remembering of what is undone and what is not yet done. One side sees its reflection, the other side simply sees through. And the mirrors of the kaleidoscope make an endless game of magic tunnels, trickery and laughter! Moonlight is louder, this is a new string to my bow. Moonlight is louder – how can you not know? Precarious, I wonder what that word means, where it comes from, the epitome of words, the epistemology of words. Words play, they have a lot of fun as they warp and weft making a pattern that not all of us can see. So I guess I need you to hear my words, to show me the patterns I have not seen. Just as you need me to show you the spaces in between. As I write the word, my mind says ‘I’m not ready yet’ and I look to the wall to see the picture of the mountain, to lead myself off into the gaze, to be called to play with threads and pins some more. I feel small animal fear scurrying to hide under a rock bigger than myself. But instead I see the word, projected from my finger tips. ‘Structure:’ it says. This is it, what you have undone, discovered, dug up from the ground: the structure to play as you write, to weave your delight. To move between the visual, the tactile, the kinaesthetic, the critic, the voice in the head, the writer, the artist, the maker, thinker, doer. This IS the structure, to weave a web in time and place that embraces all of these positions and still holds space to explore, to learn from every new moment, to chart a journey of discovery as and through it’s reveal. To make each moment new. The pins bend. Clumsily I hit them with a rock. A rock from the mountain picked up in the dusk last night as a makeshift hammer-for-pins. Time. I think of time. I think of the paper I should be writing. The deadline extended that reaches into tomorrow. The extension was not mine but it answered a call in my heart. Can I ask for my own extension, will that tear me apart? I understand what I have been striving towards these past six months since the last residency I took part in: the space to reflect, explore, create, collaborate, make new, make old, take apart and begin again. This space I wish to articulate as it unfolds. That’s what the interactivity in the moment is about. Attempting to find a way, a process, an interaction, that of itself can articulate experience unfolding in the moment of its behold. The pins bend but they do not break. The hammer is clumsy but with each strike it reminds me that I am not a carpenter building a wall; I am an artist drawing a line, I am an admirer of mountains, following their horizon, learning from the scripts they mark on the white plaster in front of me, and I am an acupuncturist, giving love with each breath, to the earth, in awe at its energy. And occasionally, the pins sing. It was only by about the fourth or fifth repetition that I realised I’d been scaling and spacing each section automatically. Probably the trigger was a short break, leaving the space and coming back into it with a new sense of bearings – different to before. Initially I just made them, without consciously thinking about it. The space, size, position, flowing seamlessly from one to the next. Flow interrupted, it was not obvious what needed to happen, only that there was an inconsistency emerging on the horizon. Solution found: check the size of the gap and the duration of the piece – if in doubt (or in case of lack of a more regulated measuring device), improvise with a blank canvas. A piece of A6 paper comes in handy, one-and-a-little-bit widths between sections. Four to five lengths duration, give or take. And the level of the horizon deliberately jumps as the eye jumps in the moment of noticing. As the camera jumps in the time between press and release and press again. To begin again. An ongoing horizon of stories told in spite of their intermittences – or perhaps more likely told by or even through their intermittences. And where do you go, when you go there? It’s interesting trying to weigh up a continuous process by specific markers along the way. My blogs (Calderwood, 2009-12 and 2011) have tried to avoid the pitfalls of interpretation or repetition of an event. However there is an inevitable punctuation in any articulation over time. Without it we would stay submerged in the pool of life, swimming swimming swimming until our breathings collapse. If the pin is not strongly enough anchored, then the thread collapses. If the intermittence is great, then the line will sag, which may convey the relaxed form of the rocks, settling into the landscape. Or it may just lose the definition that holds it all together. Similarly, if the knots are a moment too late, then the line of flow will alter. So how to find the point to mark in a line of endless fascination? As I become aware of the decision that I am making, or rather that is a decision, in each moment, that creates an impact on the articulation of the journey and of any subsequent reading and impact thereof, I realise the importance of a cohesive strategy that will give integrity to the weave, yet is not so rigid that it becomes the pattern of the weft. A fluid guidance. A state of awareness without contradiction yet maintaining a responsive and ambiguous flow. I choose to mark the points that to me seem to signal a change of pace. A change of direction, tilt, focus or movement. In the landscape this may be a small sharp cliff face or a wooded slope. Held perspectives may change – an angle of trajectory incorporating both near and far, rock, snow or tree. In experience of residency the same holds true. Conversations echo across millennia as patterns migrate one form to the next. And change may come in a moment of radical thinking in an unprompted solitude, or equally through rigorous group debate. Perhaps. And so the pace reflects my reading of the landscape at the moment of my decision as I position the next marker that will drawn the line the story tells. If you pull the string too tight the pin will leave the wall and either dangle as a misshapen appendage, or fall, releasing itself from the hapless knot, and camouflaging on the studio floor or soft cushions of the sofa. A pin can leave a legacy. I do not want to be responsible for another’s pain. If the thread is too slack, the line of the story may not hold true. It may lose its suggestion to the viewer, conveying instead a sense of apathy, inattention, or worse still, inaptitude for the study. In contrast, brisk marching from one waypoint to the next causes a harsh, irregular abruptness alien to the land and to most material form. Every mountain knows that tension is not experienced as a constant. Some parts soften as others contract or fracture. There is a waxing and a waning and a rhythm to all life. Pace (and peace) can be uncovered here too. At just the right moment, a softening, a generous slow scooping, a luscious provision of the line, reassures that all is in hand. I lie down for a moment to see the room as a different view. From the sofa I feel the drawings emerging from my desk, moving on around the room, like a column of giant ants heading where they are going. I feel the movement and sense the urgency of their communication. I run to my room and gather my laptop to return to write, write, write as they march, march, march. And I hope that if I write of their marching they will form a circle and create a pattern in their midst, then spiral outwards revealing images that speak to me of words to tell and stories to speak for the paper I must write, the joy of my heart that I long to speak yet seems to have frozen to my tongue somewhere hiding behind the warp and the weft, the daylight and the dream. Perhaps these walls can sing a song of England’s landscapes too. Only two more sections require their threads. Of course there will be more to do, weight to add, colourful details and poetic resonances to enhance the interplay of ambients. Still I have a moment of something like the opposite of anticipation. It is nice to have the space where one knows what needs doing next. When the line is complete we have to move to another level of activity. Or stagnate. Is it better to know what is unfinished than to not know what is to come? I quickly grab the laptop to write, and sit at a different desk in the hope that the apathy will not settle with me. And then delight rises and I pick up a pin, hit it with the rock, and listen to hear if it will sing. Pins can only sing in the moment. And the third pin sings as it bends, contemplating its descent into a new form. And now there is just one more horizon to map, I am excited; I am near a vantage, a viewpoint. From here I will be able to know a vista not yet seen. It is not other than me, I can feel its proximity, sense its presence. The constructions are delicate. It would be easy for someone not to notice them, to catch the end of the thought, the thread, and inadvertently it gets attached to them; as they move away it would tear. It could be possible for someone to grab it and pull, to test how strong it is, or even to try to disarm and destroy. My thoughts are not yet complete. But the outcome already lies in the form. I carefully scoop the trailing ends and drape them over the beginning way markers, unencumbered by how others may misconstrue the structure. Its story lies in wait, and meanwhile it is safe and secure, protected in its enclosure of naïve inward circling. Now as I look from the sofa I see a rocky horizon transformed into a happily flying dovelike bird. The journey has taken wings, knows its destination, and will soon land to ruffle its feathers and share its tale, safe in a new nest. When I wrote that title, it meant something other than it means today. Today, is tonight, is the dawn before tomorrow. Another four days we will be done here, going our different ways, taking with us seeds that may wither and die, may gestate for years, may grow and mutate into weird and wonderful diverse forms. The passage of pins began with a lady with a red beret. Today she is far ago, close still in my heart. Seventeen horizons. Seventeen rocks are still to find, no translation there. I wonder how I will fit colour reflections to vistas: seventeen days go by? Time has passed since I began this line of thought, and this time too needs to be incorporated: I have no interest in creating a fossil of one week or ten days ago. Geological time does that far better than I.
I wish my mountains to be [a] present to the now. How do we include our development in the work we make, the stories we tell? A living oral tradition battles with the passing of time. I notice more pins bend, losing their strength of direction, when I have the thoughts of others in my mind. Perhaps the text [thread] will be an invitation for others to contribute, to bring the work alive as their now extends beyond mine. Sequence: I’m confused. The grids start at my desk, I know that. Community starts with one self (I believe). But do they go round one at a time? They go clockwise, that much I feel: like clock time which is that which they mark in their own rhythm of intermission. Often things go the other way. Sun-wise is good for now. I like the sequence of Peck’s community building model (1978); pseudo-community, chaos, emptiness, community; find it still so often to hold true. Maybe not the doctrine around it, but the model, the experience, itself, is universal in my world. And when it is not, then my world grows. Of course a self is all-ways in relation to others, to the context, the community, the spaces in-between, the gaps where time slips down between the keyboards, the cracks in paving stones small children understand, to dance above, the bears at wait below. Bear is a dreamer, connected with the earth, emerging from the cave of new beginnings each time. Begin again bare. Each grid relates to another I, that they hold sequence over passing of time. But what time will come? How many will this multitude be? Do I position myself differently in case of any event? If I calculate the number of grids, the number of vistas, threads, spaces, then I could allocate each an equal share. But that won’t work in a currency of democracy. There are already three more made but not printed, their imprint filling a space they have yet to become. And there will be more. And more. Or not. They may stop, journey exhausted, story at an end. What then to the weight of threads unevenly distributed in the tension of moments of support. Yes, that seems to me the method I must use. A spiral is a strong form, ammonites were built of them, and here, with appropriation, we are fed by the underground riches of their shells caught in a mirror of time, reflecting light iridescent with beauty, like dragon scales, from a time past and a place that was under the sea. Ammolite is near. I wonder if my colour grids will sparkle the way the rocks do? Ammolite is a scarce resource (better left under the mountain if you ask me, except for the piece my finger wears proudly as a ring). Is it all an egoistic, narcissistic indulgence? If I open my self to the geyser of deep thought, maybe I can see the colours tinting the ink pots’ water  and let it disperse outwards into the sand. Finding its place. A single grain of sand in a frame of silt in a pool in a mountain valley, walked to with (new) friends (now) along a hike trail on a group excursion up a Johnson Canyon in a land of mystery and excitement, that I visited a very, very long time ago. Something else came from a very, very long time ago, into the breakfast room today. It was a man smiling, coming home in a canoe. He has a wide, beaming grin and a gappy smile. He is me and he is you. He is, of course, him, too. As I watched, at first I saw two boats, one receding as it paddled miniature away from shore. The other came close, the closer it got the nearer it becomes, paddling closer, challenging any interpretation of perspective (in time or space) as it rises from the place the lake would be down in the valley up several hundred feet of moisture-filled air, and in through the tall glass windows of the nearly-replete-for-now- dining room. A moment of noticing (hard not to!) of threads that weave a fuller picture of the complexities of time. Fig. 5. 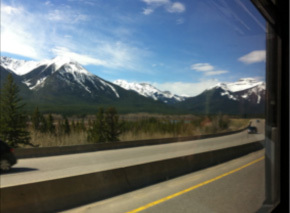 View from Bus, Journey to Lake Louise. Was ‘really there’. Where? In a place, in a moment of time past. Where is she now? In my memory, my mind, my heart? Where are you ‘really’, woman with red beret? Do you wear the red beret every day, or only in films, or was it just for me on that occasion? And to me: ‘where do you go to when you go there?’ I stir, bear emerging from cave, I spring awake, I am engaged, inspired, admiring, I am love. Not in love. In necessitates an out, and this is not a container to enter and exit. Rather love is a way of being, flying in a current of warm air, feeling the uplift under my wings, circling swooping down and beating all the harder so the one above me may feel it too, made more tansient [a transient sense of tangible] by the beating of my own wings, a reminder a mirroring a remembering that you can fly too. Just feel the updraft, take control of your being, and soar. To be better than the best, and never as good as. That came into my mind again today. Keep striding, never stand still. Always stand still, take in the surroundings, feel the earth. Move when you are moved to do so. To begin, to begin again. To be better than the best. Who would want to be other? Your children are not your children. They are the sons and the daughters of Life’s longing for itself. They come through you but not from you, And though they are with you yet they belong not to you…. their souls dwell in the house of tomorrow, which you cannot visit, not even in your dreams. You may strive to be like them, but seek not to make them like you. I can never be the you you are, and why would I want to be? Want not to be me? Always I can be better than you – I can take the gifts you bring, add my own, and we can grow. Always I can never be as good as you, we are each unique. You bettering me, me bettering you, bettering each other and inviting the rest. I’d love to love the you you are today. Where do you go to when you go there? Manifests in the breath. Today we meet Lungs (Spahr). I read the words, following lines of texts with my eyes as my ears listen, hearing the words. A comment on flatness, on the panorama focusing in the now through the dimension of space. Reciprocal comment on time. Argon in breaths past, future, yet to come. I am awake. My sense tinge, this intersection of dimensions is what I’ve been seeking in my work. The panorama of the thread mountain lines, the furthest form we can see here before it becomes just air. The vertical drops to the rocks, anchoring the sense of inside movement of the earth. We are ancient, as is the land. We are, as, the land. We are, the land. We are land. We are. We. And I like that this Suzuki argon scientist  has returned to call himself elder, to talk through the ‘ancient’ elements: earth, air, water, fire. I like this coming together, and I feel it as a force of support behind me as I follow my journey towards the horizon of the next mountain skyline, pins and thread. Ingold’s dots and lines (2008). What vistas will spread before me from that vantage point I can only now begin to sense as misty dream, begin to feel the majesty of the terrain, the awesome view from above, before beginning the descent to the valley of rocks and all the surprises challenges and richness it contains. An ocean floor lifted up on top of the earth, and to begin again. If one space know things another may not yet have seen, then what will become as I hang the washing line of my colour grid prayer flags dutifully in place? On place, the typo read. On is more apt to the benevolence of the landscape. 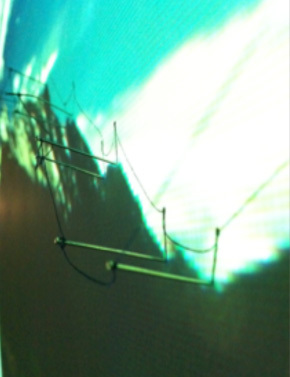 Words and colours suspended on double-sided tape, aiming to bridge a divide. Speak to both surfaces of the coin at once, and just perhaps, in the movement of colour twisting on thread, reflecting light from the studio window as it turns, reach the in between space where magic occurs. Occur, occult? What a strange word, what does it mean? “to happen, come about”, “to exist or be present”, “to come into somebody’s mind”. I like occurs. I smile occurs. I sing in my flesh occurs. I occur. In my own mind, my own mind in me. Can mind occur? Is that the same thing as presence? Clean Space is presence, and in it wonderful things occur. Psychoactive landscapes are contagious and belligerent and benevolent and quite mad. When reality crosses over into the dream and the air buzzes with contagion, new answers, idiosyncratic form and patterns of infinite reach stretching out and in again like a giant squidgy octopus flowing with the unseen currents of a fluid moving well beyond surface /superficial illusion/tricks of light. So what will one colour grid know from here in the landscape, about another moment, over there? Will I want to connect them up, a giant spider web knitting across the studio, a cats cradle to jump through, turn in and out, in order to reach a point of new form, within the destination. The place is fixed, the routes through it vary infinitesimal. To work, to play, to discover today. Some pins come out easily, some resist. Those that went in worst come out first. Undoing is part of the making new. To begin again. I had thought I’d keep the pins, paper, all to take with me. Only the grids. Another set of texts would be welcome now. Grids from a consultation, community, workshop on research. I had imagined more Commons grids. Not to be with such busy people all working on their own projects. It is a practice run for the very, very different but not so totally unrelated synaesthesia paintbox. Now to bed! I came to BRiC not really knowing what I’d do or find. I came knowing the proposal I wrote six months earlier no longer held all the strings. My practice had moved on massively, and even taken wings. I came to listen, find a place, that called response within. I never thought I’d find this way  to make my mountains  sing! for what lies ‘neath my mind. Stitching threads together as we go. delicately tracing the horizon of it all. Looking for spaces connecting to worlds deep below. it is here that I found you we came face to face. Magical creature you now know my name. And even, (and this may be the key) benevolence toward our self. Calderwood, Jackie. Hunter Gatherer. Computer software. Apple App Store. Vers. 1.0. Cuttlefish Multimedia Ltd, 04 May 2011. Web. 10 May 2012. Calderwood, Jackie. Warp and Woof: Canadian Travels. Jackie Calderwood, Summer 2011. Web. 10 May 2012. Calderwood, Jackie. Warp and Woof: Threads of Interest and Activity, Inside and Outside, Durational Patterns of my PhD Studies. Jackie Calderwood, 2009-2012. Web. 10 May 2012. Faulkner, Charles. “Symbolic Patterns: How the Fundamental Distinctions of Mind Shape Language and Experience.” International Clean Conference. City Of London University, London. 23 Oct. 2010. Keynote Lecture. Geary, James. “Mixing Metaphor with Daily Life.” International Clean Conference. City Of London University, London. 24 Oct. 2010. Keynote Lecture. “Geo Art Cache Project.” Geoartcache.com. 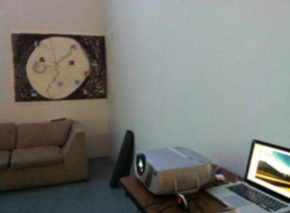 Chrysalis Arts Development Ltd, 01 May 2011. Web. 10 May 2012. Gibran, Khalil. The Prophet. (1823) Ed. Paul Coughlin. Ebook. 25 June 2011. “Hunter Gatherer” Gatherer3.com. Jackie Calderwood, 01 May 2011. Web. 10 May 2012. Ingold, Tim. Lines: A Brief History. Abingdon, Oxon: Routledge, 2008. Print. Lawley, James and Tompkins, Penny. Metaphors in Mind: Transformation through Symbolic Modelling. London: The Developing Company Press, 2000. Print. Oliver, Jim. “Geology of Banff.” BRiC. The Banff Centre, Canada. 10 May 2011. Lecture and Guided Walk. Peck, M. Scott. The Road Less Travelled: A New Psychology of Love, Traditional Values and Spiritual Growth. Ed. Touchstone. 25th Anniversary Ed. New York: Simon & Schuster, 2003. Print. Spahr, Juliana. Everyone with Lungs. Berkeley and Los Angeles: University of California Press, 2005. Sullivan, Wendy and Rees, Judy. Clean Language, Revealing Metaphors and Opening Minds. Carmarthen: Crown House Publishing Limited, 2008. Print. Szeman, Imre. “Liberalism after Neoliberalism”. BRiC. The Banff Centre, Canada. 24 May 2011. Public Lecture. Movement, interaction and contagious laughter, during an improvisation workshop with Pedro Reyes, visiting faculty at BRiC 2011. Traditional North American saying often attributed as a Sioux or Cherokee prayer, used to indicate the value of the non-judgmental ability to learn through high-quality listening and empathic resonance with another’s life experience. Sometimes phrased as ‘do not judge another until you have walked a mile in their moccasins’, the saying can be found within contemporary health and wellbeing discourse. Author James Geary posed the question ‘which is louder, sunlight or moonlight?’ during his keynote at the Clean Conference, 2011. Around 99% of the 100 strong audience opted for sunlight. Apparently this is a common level of response. Personally I find moonlight to be louder. Becoming aware of this alternative relationship to metaphor has led to other significant insights. ‘To begin again’, used with reference to Charles Faulkner’s keynote Symbolic Patterns: How the fundamental distinctions of mind shape language and experience at the International Clean Conference, London, October 2010. To begin again, to reiterate the significance of the pattern of ‘one’. The Ink Pots’ at the top of Johnson Canyon are geyser-fed colourful clear pools at a constant temperature all year round. Synaesthesia Paintbox is a proposed installation, conceived by me in February 2011 in response to the Pervasive Media Studio call for work on the theme of ‘C21st refraction’. The installation comprises a paintbox of coloured glass tablets which are used to filter data. 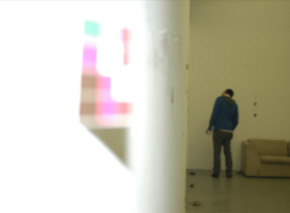 The data (digital colour grids and audio, mapped across the walls of the physical space) can be explored and ‘played’ as a multi-sensory interactive installation, for example exploring the ‘red’ of one city in contrast with the ‘blue’ of another. I have been using the sound of rocks (lithophones) in Hunter Gatherer http://www.gatherer3.com/ingleton. A search for rock recordings in the Banff archives showed up no thing. And in the gap, a different song emerged. The symbolic landscape I have frequently modelled over the past few months, around the time I was waiting to hear whether I would successfully make it off of the reserve list and onto a real place at BRiC Banff, is the mountain…..
Jim Oliver’s geology lecture at the Banff Centre (10 May 2011) http://wwcanada.blogspot.co.uk/2011/05/geology-of-banff.html was a key illuminatory contributor right near the beginning of the residency. I had plans for a sound walk, interacting with another in a different time and space (I’d already taken remote part in Jen Rich’s research art walk with East Midlands (UK) New Research Trajectories group, the previous morning pre dawning) but this led in a direction none of us had expected! ‘Fame’ is used here not in the context of celebrity, but rather in the sense of being the best one can be: of overcoming the fear to step up and share one’s presence. In Peck’s model of community, accepting personal strengths and weaknesses are of equal significance in collectively moving from a state of emptiness into one of community.